It's hard to not love penguins. Very hard, in fact. Cuteness factor is through the roof, and I'm convinced that most people actually just want to hug them. 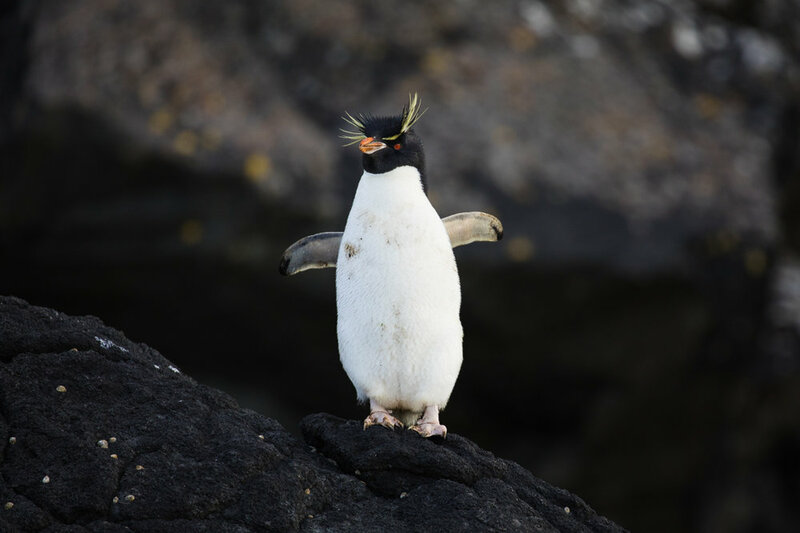 I am happy to report that sub-Antarctic penguins do indeed look very cute, with a healthy dose of comical and adorable. On our sub-Antarctic voyage we saw four penguins in total. I'm not going to talk about the Little Blue and Snares Crested Penguins as we had pretty distant views of them in the ocean. But boy did we have great views of the Yellow-eyed and eastern Rockhopper Penguins! Eastern Rockhopper Penguins on Auckland Island. The rockhoppers in particular we had a great time. The unusually calm waters in Perseverance Harbour (Auckland Island) allowed us the luxury of searching the nearby rocks by zodiac, where some of the approximately 8000 nesting pairs on Auckland Island live. Eastern Rockhopper Penguin, living up to its name. Auckland Island. These guys are such characters. They have an incredible range of expression - they can look crazy, funny, angry or magnificent. We were fortunate enough to spend almost an hour photographing them, and because of the calm waters were able to bring the zodiacs quite close to the rocks. Eastern Rockhopper Penguin having a good old yawn. Auckland Island. One of the things that intrigued me most about them was their long, spiky, yellow crest. It certainly looks magnificent, but I wonder what role or what function it plays in penguin life. There are about 7 similar species with crests of varying lengths so presumably it is important or advantageous. My guess would be that it would likely be used to attract mates. Fun fact: Lovelace from the movie Happy Feet was a Rockhopper Penguin. Eastern Rockhopper Penguin, Auckland Island. The Yellow-eyed Penguins were super cool as well. I think they are a seriously attractive bird, with the pale, streaked nape, yellow eye and orange bill. 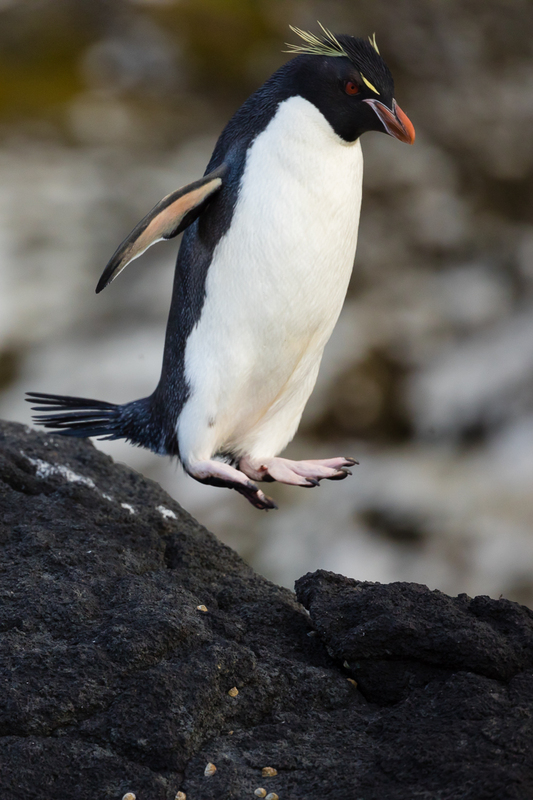 They are often cited as the rarest penguin in the world, with an estimated 4000 individuals remaining. The majority breed on Auckland and Campbell Islands, but about 600 pairs breed on the South Island of New Zealand. Yellow-eyed Penguin on Enderby Island. The Yellow-eyed Penguins on Enderby Island (near Auckland Island) were a little wary at times, and we were careful to keep our distance particularly where they were trying to get or from the beach. At one point though, we were lying by the side of a small pond photographing Auckland Island teal, when a penguin slid into the water just beside us to check us out. We managed a few quick photos before we retreated to allow it to continue on its way. Yellow-eyed Penguin coming to check us out as we were photographing teal. Enderby Island. Yellow-eyed Penguins posing on Enderby Island.